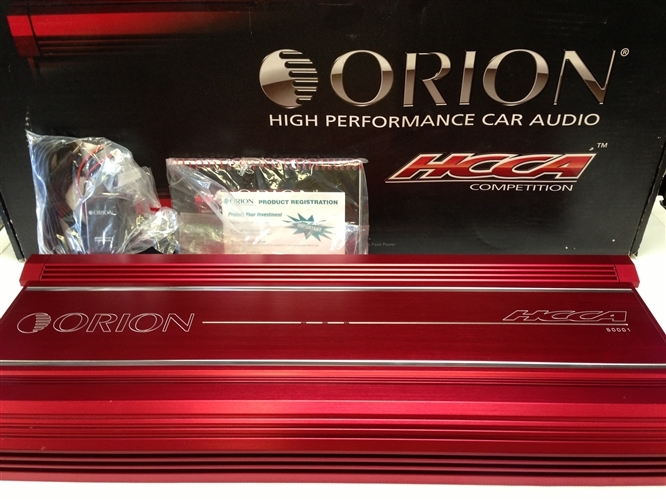 Brand New In Box ORION HCCA50001 HCCA Competition Series Mono channel 5000 watts RMS car amplifier. This is Orion's High Current Competition Class D Mono Channel amplifier. Perfect for use as your bass amp or full range needs. This is a true BEAST of an amplifier made for the serious audio competitor and enthusiasts. 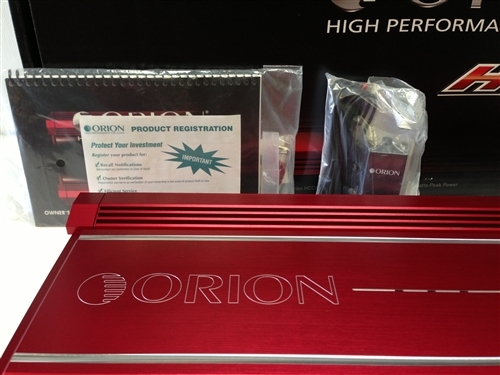 Orion's long history of producing nothing but the best subwoofers and amplifiers are exemplified if their TOP tier model the HCCA. The design and craftsmanship of these amplifiers are like nothing else on the market, built in a heavy duty rugged die-cast aluminum heatsink with nothing but the best mosfets and internal components. All units are in stock with FREE UPS GROUND SHIPPING. Units are sent immediately!! Factory sealed with all original manuals, bass knob, and packaging. In the 1980's, the technology was transistors and massive class AB designs that stretched the length of a football field, today it's more efficient MOSFET class D designs, but the outcome is still the same: serious amounts of power driving ridiculously low impedances at completely sick output levels. Whether you're looking for an SPL world record or you just want to do some serious damage on the streets, these amplifiers wil ensure they hear you before they see you. Hellacious power intersects with extreme efficiency under rugged die-cast aluminum covers with illuminated ORION badges that tell the world that HCCA is back! And to make the comeback even sweeter, these amps even offer our patented ESP2 features. ESP2 is a proprietary protocol used to program various features within MD Audio Engineering's security and remote start products. This protocol has been adapted to further enhance the capabilities of the ORION amplifers. The new terminal connectors accept larger gauge wire, simplify the installation and improve the cosmetic look of the install. With less overall insertion loss, the overall power and performance of the system is improved. Extruded aluminum delivers solid aluminum heat sink for maximized performance. These days it is much more likely that the consumer will be using the factory head unit with these amplifiers. To aid in the installation, we have equipped these amplifiers with high-level inputs that also include an Auto-Sense circuit. ORION's high-level inputs accpet voltages from 1V to 10V from the head unit's speaker outputs. When more then 1V is detected on the speaker line, the amplifier will turn on. Once the voltage is gone for more than 30 seconds, the amplifier will turn off. Through the ESP port on the amplifier while using a MD Audio Engineering Bitwriter, the gain setting can be locked out to prevent the gain adjustment from being changed. Matched outputs have less notch distortion and better sound quality. With symmetrical output designs, clipping the output creates an even order distortion (as opposed to an odd order distortion). if the outputs are not matched correctly. Even order distortion is much less offensive to human hearing. Thermal stability is improved as heat is dissipated from the devices more evenly. Connection of the optional RGC2 remote mountable gain control, which is included with all HCCA amplifiers, allows variable adjustments of the gain from the driver's seat. The RGC2 is only active when the crossover is set to low-pass. Clean/efficient layout that helps to reduce hot spots and noise due to clutter or un-equal grounds or heat transfer. ORION HCCA amplifiers are equipped with the 0-180Ã‚Âº phase switch. Depending on the acoustics of the vehicle, the low frequency response may be improved by inverting the output of the amplifier to the woofer. Aids in the elimination of unwanted noise or harmonics at very low frequency that may degrade the sound quality of a subwoofer and/or enclosure caused by distortion or over excursion from those unwanted noises and harmonics. The HCCA line offers extensive control under the locking top panel. This is done to keep the aesthetics for a clean installation while offering easy access for tuning. Turn-On Delay. 4 ohms: 1250 watts x 1 chan. 1 ohms: 5000 watts x 1 chan.